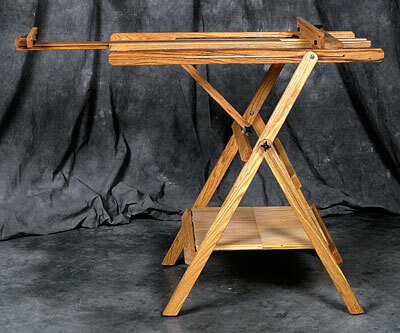 Built of solid oak, this quad–based easel is perfect for the mixed media painter. It is inexpensive, compact but sturdy, reliable and very flexible. Can be used vertically for sketching or painting and in just seconds can be adjusted to a horizontal position for watercolor, gessoing or varnishing. Plus, the Deluxe Lobo features a built in shelf for supplies or books. The Deluxe Lobo adjusts quickly to a variety of settings for sitting or standing, and tilts forward to reduce glare for the pastel artist. Base width/depth: 25" x 27"
240 points will be rewarded when you are logged in to your account and buy this item.